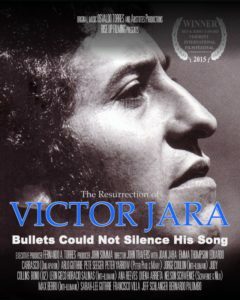 This feature documentary presents the heroic yet tragic story of Victor Jara: from his rise to prominence as a noted theater director, to his years as a folk-inspired troubadour, finally to his execution at the hands of Pinochet’s military regime — a junta responsible for summarily executing or ‘disappearing’ thousands of Chileans. Victor’s story continues with his powerful cultural resurgence in recent years as a symbol of the struggle for human rights and social justice. Some of today’s most prominent artists, along with Victor’s friends and family, have joined together to tell his story. 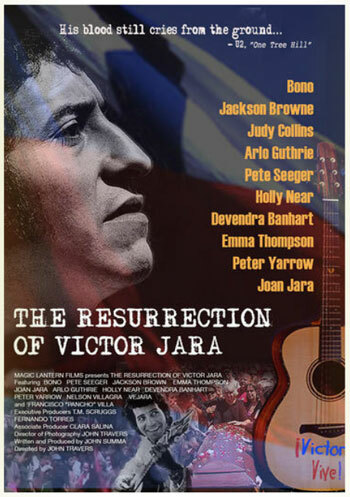 Among them are Pete Seeger, Arlo Guthrie, Emma Thompson, Peter Gabriel, Judy Collins, Jackson Browne, Victor’s widow Joan Jara and Bono, who wrote about Victor in the classic U2 song, One Tree Hill.